Originally, falafel is a deep-fried ball made of ground chickpeas, fava beans, or both. However, falafels can also be shaped flat or as a doughnut. The recipe itself originates from The Middle East where it has become a common street food or fast food. 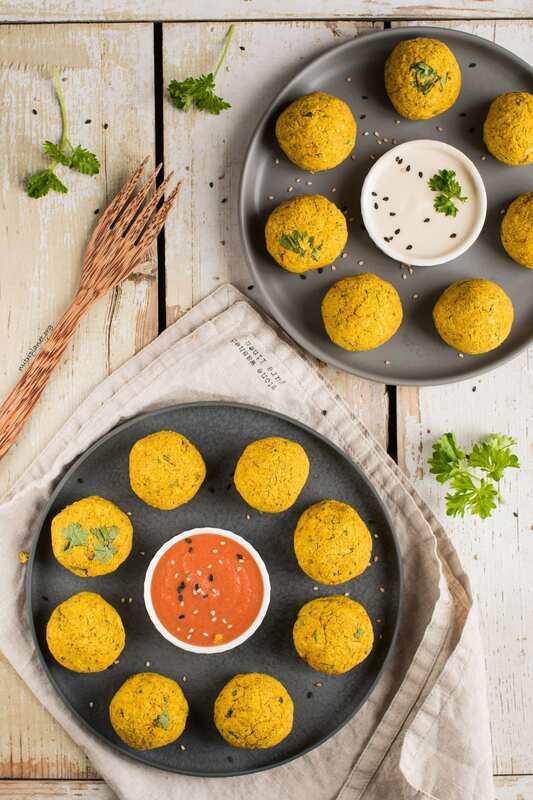 Falafels are usually eaten in pita bread or wrapped in a flatbread. 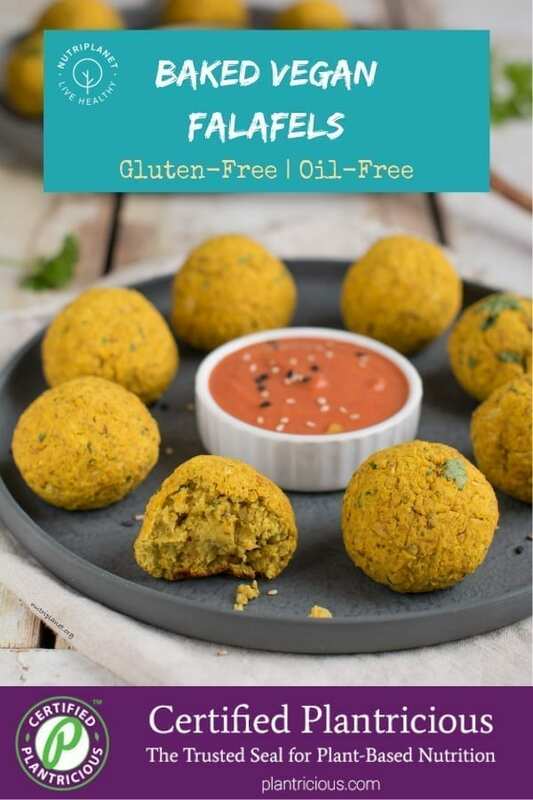 I can honestly say that my baked vegan falafel recipe turned out great – it is full of flavour and has perfect consistency. In order to get the crispy layer, I put my oven to fan mode for the last five minutes. Of course, it cannot compete with the deep-fried version when it comes to crispiness, but for me the flavours and wholesomeness are much more important. How about you? As for the binding agent, I use ground chia seeds in this falafel recipe. You might also go for ground flax seeds or psyllium husks, but you’d need to add more of the first and less of the latter. See more under tips further down. Lastly, I’d like to point out a rather unconventional ingredient in my vegan falafel recipe, i.e. raw cauliflower. Now, I don’t add it just to be original! On the contrary, I always try to find ways to make recipes healthier and lower in glycemic load. 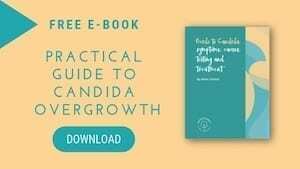 The latter is especially important for people with Candida overgrowth and unstable blood sugar. I absolutely love cauliflower, because it is such a versatile ingredient that adds lean mass, but doesn’t mess up the recipe. Grated cauliflower makes a great addition to low glycemic porridge, pizza crust, and even chocolate pudding. Whenever I can, I prefer to soak (when possible, also sprout) and cook my own chickpeas. However, I always have cans of organic unsalted chickpeas and black beans in my pantry for emergency situations. 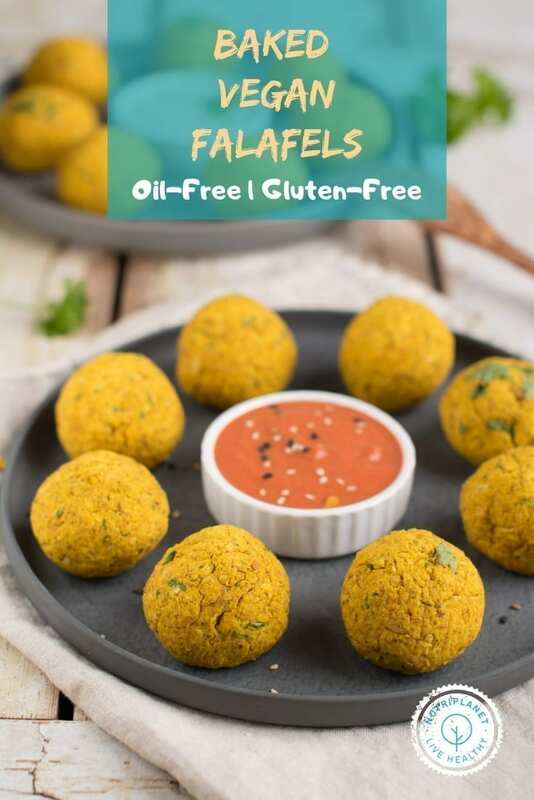 I recommend making falafels with cooked chickpeas rather than with chickpea flour as the latter is made of dry chickpeas. 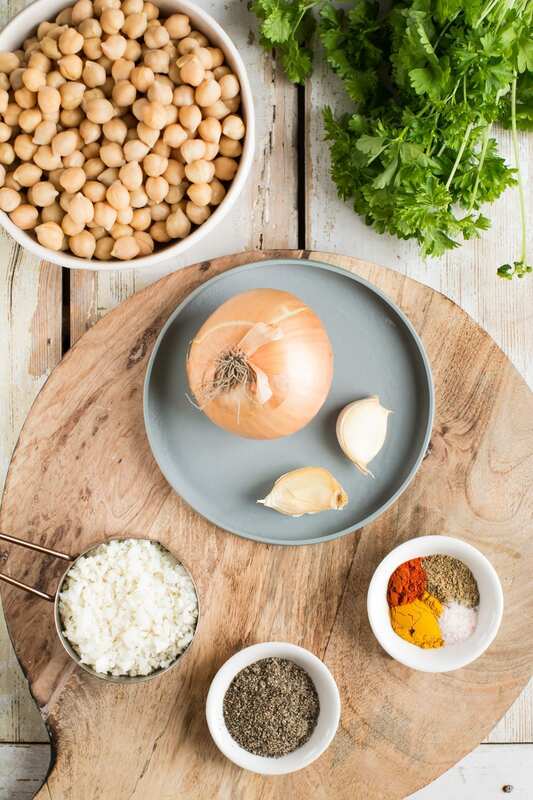 The problem with dry chickpeas is phytates that inhibit mineral absorption and cause digestive ailments. Soaking and sprouting activates enzymes and significantly decrease the levels of phytic acid. And no, aquafaba (cooking liquid of beans and chickpeas) is not a healthy ingredient to use in recipes. Believe me, I’m not just saying – I once tried it out of curiosity and was in such pain afterwards. So, never again! Perfect snack with dip sauces! It’s so easy and simple to make. Requires only 15 minutes of prep time. Great recipe for batch cooking. Falafels in a balanced Buddha bowl. Tips on my vegan falafel recipe. 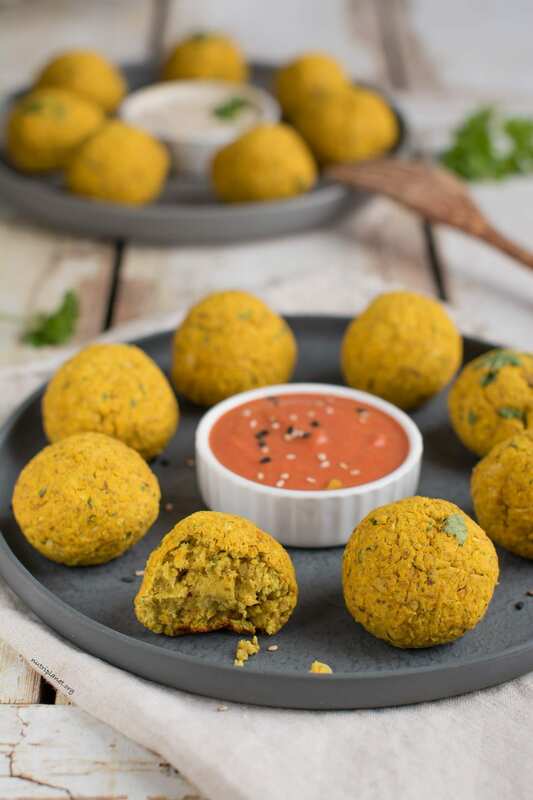 Recommendations for serving falafel balls. Suggestions for combining a balanced meal and keeping your blood sugar stable. The list of my favourite veggies for steaming, oven roasting, using in stews/curries and for eating raw. Start by properly rinsing and draining canned chickpeas. Then, peel and roughly chop onion and garlic and grate or process raw cauliflower. Next, add the chickpeas, ground chia seeds, cauliflower, spices, Himalayan salt, black pepper, onion and garlic into food processor. Process until you have fine crumbs. Scrape sides whenever necessary. Finally, add water and fresh parsley. Process again, until you have homogeneous batter, but avoid mashing it up too much. Let the batter sit for 5 minutes to let chia seeds absorb water. Then, line baking sheet with parchment paper and start shaping about 40-gram (1.4oz) falafel balls with your hands. You’ll have 16 balls. Place them onto baking sheet and bake at 190°C (375°F) for 25 minutes + additional 5 minutes with fan on. Let cool a bit not to burn your mouth and let the flavours set. 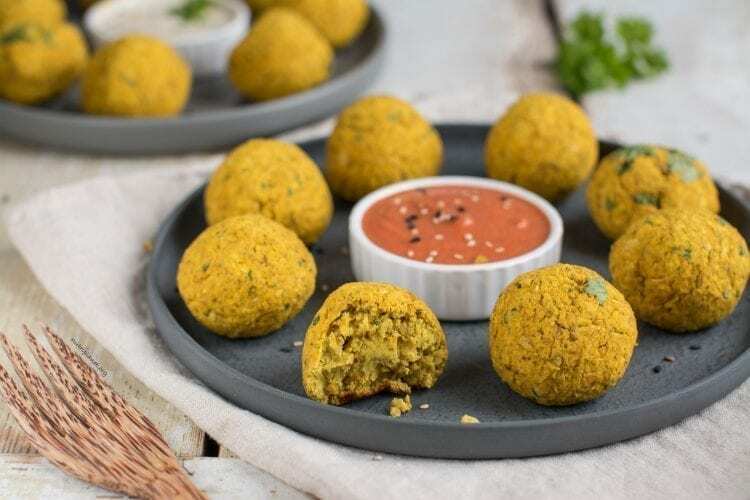 Nutritional info per one falafel ball (1/16 of recipe): 108 kcal, 14.4g of carbohydrates (67% of kcal), 1.8g of fats (15% of kcal), 6.62g of protein (24.6% of kcal), 3.6g of fibre, 80mg sodium, and 3.2 GL points. Feel free to use home cooked chickpeas instead of canned chickpeas. If your home cooked chickpeas are drier than the canned version, add some additional water to the recipe. Check the consistency from video. I always prefer to use food processor’s S-blade to grate cauliflower – I find it creates much less mess this way. I usually process a bigger batch and store leftovers in sealed containers in fridge or freezer and use it up in recipes (pancakes, porridge, and even brownies). You’re welcome to use any preferred curry powder, if you don’t have the time or ingredients for my dry roasted Indian spice mix. Should you want to substitute chia seeds with ground flax seeds, add 2 tablespoons. If you’re allergic to garlic, just leave it out. In case you don’t tolerate raw garlic, substitute it with about ½ teaspoon of garlic powder. Should you be too lazy or busy to shape those symmetrical balls, make them flat instead. Finally, it is a great recipe for batch cooking – freeze the balls and store in sealed container or zip-lock bags for up to a month. Have them as snack or entrée with plant yogurt or easy lemon-tahini dip sauce (tahini, lemon juice, water, Himalayan salt and black pepper). For tomato dip sauce add some unsalted tomato puree and smoked paprika to lemon-tahini version. I also added a few drops of stevia for a sweet hint and sprinkled some sesame seeds on top. Add 3 falafels to balanced Buddha bowl made of lot’s of greens (raw lettuce and steamed chard, kale, collard greens or pak choi), steamed veggies (broccoli, Brussels sprouts, asparagus, green beans, Chinese cabbage) and/or oven-roasted veggies (beetroot, summer squash, parsnip, bell pepper, pumpkin, potatoes, sweet potato, fennel, eggplant, cauliflower, mushrooms, carrot), and some raw veggies (carrot, sauerkraut, celery, turnip, red cabbage, cauliflower). Pick one or two of each category and you’ll have a nourishing and colourful bowl that you can’t wait to finish. If you eat grains, add wholegrain pasta, rice (brown, red, black, wild), buckwheat, millet, teff, quinoa or amaranth to your Buddha bowl. ⅕-¼ cup cooked grains would be the right amount. 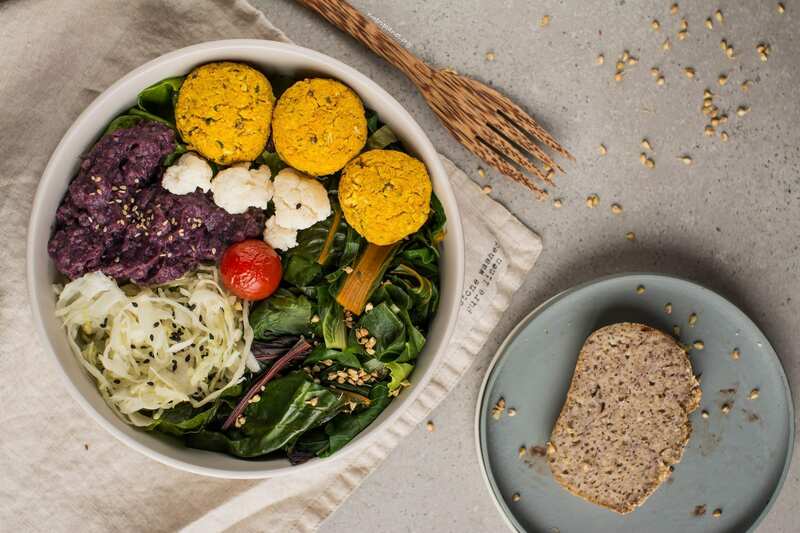 Choose one starchy veggie (potatoes, sweet potato, parsnip, winter squashes) or a grain to add to your Buddha bowl, but don’t have both (in addition to falafel balls). As far as the quantities are concerned, have about 50g (1.8oz) of cooked potatoes or sweet potatoes, 200g (7oz) of pumpkin, 70g (2.5oz) of boiled parsnip, or 100g (3.5oz) of cooked beetroot. Finally, have no more than ⅕ cup (45ml) of cooked grains, if you’re struggling to keep your blood sugar stable. If you have pasta, weight about 15 grams (0.5oz) of dry pasta. 3 falafel balls (9.6 points). 85g (3oz) of cooked beetroot (3.4 points). 150 grams (5.3oz) lettuce + 50 grams (1.8oz) chard + 50 grams (1.8oz) raw red bell pepper + 50 grams (1.8oz) steamed broccoli (7 points). For example, have less falafel balls and/or starchy veggies, if you want to include some grains. You can also add several starchy veggies into the same meal – just divide the points between them. Go wild with the non-starchy veggies – choose different ones with different colours to create your own rainbow. However, always remember to include leafy greens and/or lettuce, something raw, and something steamed or oven roasted (without oil). First, the veggies that I like to steam include Brussels sprouts, broccoli, kale, chard, spinach, pak choi, sweet potato, artichoke, asparagus, Savoy cabbage, Chinese cabbage and green beans. Next, I enjoy oven roasted: fennel, eggplant, bell pepper, mushrooms, beetroot, carrot, parsnip, potatoes, sweet potato, winter squashes, summer squash, cauliflower, sweet onions, turnip, Jerusalem artichoke, and cherry tomatoes. Then, I like to eat raw the following veggies: lettuce, sauerkraut, chicory greens, radishes, parsnip, red cabbage, celery, carrot, turnip, cucumber, and tomatoes. And finally come the veggies that I almost exclusively like to use in soups, stews and curries, i.e. I don’t usually steam, oven roast or eat them raw. These are garlic, onion, leek, and tomatoes.